Talk about anything on your mind! This is now a thread for everyone to reminisce about our fallen friends of the non-human variety. My original post when I made this thread is below. I am no longer seeking donations for my late cat's veterinary expenses. Thank you to anyone who was able to donate or spread the word during those trying last few days of KC's life. I posted last year in the Pet and Animal Thread about my longtime feline companion KC's cancer diagnosis. Tabatha and I have been helping him fight gastrointestinal lymphoma and all that it entails for more than a year and he just had a very bad episode on Friday, March 29 and had to spend the night in the intensive care unit at the emergency animal hospital. He has been recuperating at home with us for the past two days as we explore our next options. We don't know what's going to happen next but the medical expenses are mounting fast and hitting us hard. We've been able to do this on our own for the past year but now we need help. With all of my heart, PLEASE DONATE to help us with KC's medical expenses! Every dollar and every cent will mean the world to us! Even if you can't donate, PLEASE SHARE THIS PAGE! Just sharing this page would help us tremendously! KC has been in my life since just a few months before I joined this message board in 2004. He has always been there for me and I'm doing the same for him. If you can help at all, even just by sharing this page around, it would mean everything to KC, to me, to Tabatha and to our whole family. Last edited by Benjamin Haines on Sat Apr 20, 2019 1:12 pm, edited 2 times in total. Re: HELP KC FIGHT CANCER! Sorry to hear that! We had quite a few of our four-legged friends reach the end of their (thankfully) long lives in the last couple years. It's never easy. Thank you, lhb412. No, it's never easy. To Tab and I, KC is a part of our family just like the other two felines that we rescued. We've been five strong for five years now and it is pure bliss for me. I love my family. Helping KC fight cancer has been stressful and terrifying, especially this past weekend and the days since, but we know it's harder on KC than it is on us and we're sticking by him all the way. He doesn't know why this is happening to him but he knows that we're his family and that we're here for him. We don't know how much time KC has left but it ain't over 'til it's over and we're not going to stop fighting for our family as long as there's hope. I'm taking KC to an oncologist today to discuss our next steps. Even if you can't donate, PLEASE just share this GoFundMe page with other people! If you have a Facebook account, Twitter, anything, PLEASE help us just by spreading the word! We are desperate and we need all the help we can get. Now more than ever, I am definitely sympathetic to this cause. I normally don't share like this, but my own wife was diagnosed with Breast Cancer at the end of January. Now this is definitely treatable, and things are going to get better for her. She has undergone 2 Chemotherapy treatments, and has 2 more still to come, then, hopefully, a less evasive surgery sometime around the end of May depending on what the results of the chemo produce. While my employer does provide medical, its not the greatest, with a very high deductible (and lord I cannot believe how expensive these treatments are!). However, we had the miracle of an unknown benefactor (a family member or friend, who chose to remain anonymous), pay our expense for this year. This is no joke, we were blessed, but not everyone has such circumstances. Now, while I would never equate the life of a human, to that of an animal, I love pets, and to see them suffer is immensely troubling. I'm definitely not in a position to donate much, but if I can, I certainly will. Thank you, O.Supreme. Whether you're able to donate or not, just sharing this GoFundMe page would be a huge help. I'm so sorry about your wife's diagnosis. I can't imagine how difficult and scary this process must be for you and for her but I'm glad that it's definitely treatable. It's amazing that you and your wife were blessed with an anonymous benefactor who covered all of her medical expenses for this year. I'm really hoping that a hero like that will see KC's GoFundMe page and help us out too. So far, six people have donated $95 which I'm just blown away by. The medical expenses are still a lot more than that but just the fact that we have friends, family and two anonymous donors who have chipped in that much already just means the world to me. PLEASE, everybody, SHARE THIS GOFUNDME PAGE even if you can't donate! I know I'm a broken record here but this is critically important to me and to my family. We need more people to see this GoFundMe page! Every little bit helps! I haven't posted yet incase you wanted to do it yourself, but I can definitely do so! From his pictures, I can see that he's a cute cat. I wish you all the luck in the world, even if I can't give you money. Thanks for the tip, tbeasley. Thank you for the well wishes, mbozzo. KC's battle with cancer is over now and he is resting in peace. After spending the night in the hospital on Friday, he got to have four more nights at home with Tab and I. Having had catheters in two of his legs and multiple injections in another, his legs were sore and walking was a strain on him so we helped him get around as much as possible. He was resting a lot but he seemed to be slowly improving each day, gradually regaining his strength and his appetite, lying on our laps, purring when we pet him as recently as yesterday at 3 PM. We knew that he didn't have much time left, his prognosis was just a few months, and we knew we would have to decide when it would be better for him to be set free. We just wanted and hoped to help him recover enough from this past weekend to be able to walk around normally, eat as much as he used to and do the things he loved again one more time. However, KC took a turn for the worse later in the afternoon yesterday. His energy was depleting rapidly so I made the call. I had arranged with his vet to have them come out to our home today at 12:30, but after their office was closed, KC vomited what he had eaten for lunch. Although there was no blood in his vomit, I knew that he wouldn't make it through the night and this morning. I called a vet who does after-hours house calls and she got here around 9 PM. With KC lying on a comfortable quilt in our living room and Tab and I soothing him, the vet administered a sedative that eased his pain, calmed his nerves and slowly made him fall asleep, then she administered the euthanasia after he fell asleep. Tab and I were the last thing that KC saw, our voices were the last thing he heard, and our hands petting and holding him were the last thing he felt. It was the right exit for KC and I'm so thankful that we were able to give that to him before it was too late. One of my co-workers allowed us to bury KC on his property, a remote wooded area up high on a windy hill. Tab and I dug his grave early this afternoon, buried him with his favorite robe wrapped around him, and planted catnip over him. Re: Rest In Peace, KC. Man, I'm so sorry. That crap is always difficult, no matter how long you live and how many times you go through the same thing with subsequent pets. Sorry Ben. Losing a pet is terrible. Oh My...I'm so sorry..... . I've always been partial to cats, and losing them is never easy. Take Care of yourself. Keep close with family and friends. My best wishes to you...and yours. Sorry to hear about KC's death, you and your family have my deepest sympathies. Watching a pet die is always very difficult -- I'm certain that KC appreciated you and Tabatha being there with him in the end. God.. I am so very sorry to hear about your cat's passing. I sympathize whole-heartedly. Between my wife & I we have dogs, cats and ferrets. We are unable to have children and so each and everyone of our little fur kids mean the world to us and we become so attached. It kills you with every loss. My big guy, Zeus, was diagnosed with bone cancer almost 2 years ago, and in less than 6 months he was gone. We had to have him put down when the cancer hit his lymphatic system and it went to his throat and his neck swelled up to the size of a wash bucket, literally overnight. The day we had to have him released was, ironically, the same date that my father passed away when I was 16. I can assure you that THAT was NOT a good day. I never thought I would miss that big goofy stinky dog, but I was practically a zombie for weeks afterwards. We still have my wife's little dog so that helps. Some day I will get another, when the time is right. I am more of a cat guy however, as that was my first pet as a child. I have one old gal whom I have owned since discovering her, abandoned, as nothing more than a tiny fluff of fur I could hold in one hand. She is heading towards 13 and her health has really gone down hill recently. It is going to devastate me when her time comes - and I am terrified at the prospect. Their love is complete and unconditional and 100% real. They don't care if you're rich or poor, old or young, tall or short, thin or fat... just that you love them and make them feel safe, and loved. And that love is returned to you a thousandfold ...and they never truly disappoint you, until they leave you. The pain is so very hard... but those few weeks of sorrow are totally offset by the years of joy (and yes, frustration - LOL) that they bring you. You both fought the good fight, along with KC, but when the time came did the right thing. The expenses can be astronomical and, even if you can afford the cost of treatments & medication, in the end you really must put your own feelings aside and determine what is best for your beloved pet. Quality of life is everything. If they're not enjoying life and your efforts are honestly more to make yourself feel better that you're doing all you can (and because YOU don't want them to die) then you must step back and reevaluate. You guys did the right thing. Not the easy thing, certainly, but the right thing. He's out of pain and you can both begin the healing process now. Thoughts now can be happy memories of past joys & love and all the good times, rather than the anguish & stress that were there every day as you struggled to deal with KC's pain. Ben, our very deepest sympathies to you & Tabatha. Godspeed to you both. Thank you all for your condolences. It really means a lot to me. KC was only a few months old when I joined this message board in 2004. I remember him being there as a kitten when I was following the production of Godzilla: Final Wars. I made this thread out of desperation but now it's become something therapeutic. Jinzo Ningen wrote: God.. I am so very sorry to hear about your cat's passing. I sympathize whole-heartedly. Between my wife & I we have dogs, cats and ferrets. We are unable to have children and so each and everyone of our little fur kids mean the world to us and we become so attached. It kills you with every loss. My big guy, Zeus, was diagnosed with bone cancer almost 2 years ago, and in less than 6 months he was gone. We had to have him put down when the cancer hit his lymphatic system and it went to his throat and his neck swelled up to the size of a wash bucket, literally overnight. The day we had to have him released was, ironically, the same date that my father passed away when I was 16. I can assure you that THAT was NOT a good day. I never thought I would miss that big goofy stinky dog, but I was practically a zombie for weeks afterwards. We still have my wife's little dog so that helps. Some day I will get another, when the time is right. I am more of a cat guy however, as that was my first pet as a child. I have one old gal whom I have owned since discovering her, abandoned, as nothing more than a tiny fluff of fur I could hold in one hand. She is heading towards 13 and her health has really gone down hill recently. It is going to devastate me when her time comes - and I am terrified at the prospect. Thank you, Jinzo Ningen. You're absolutely right about how real and mutual the love between a human and a pet can be. I'm sorry about Zeus and I really hope your cat's health issues prove to be manageable. This is by far the most difficult experience of my life. I had pets growing up but usually my parents ended up giving them away for unloving reasons. The first pet I ever had was a little black puppy named Pup when I was 4. I loved her and I still remember getting her to chase me up and down the sidewalk. Two weeks after we adopted her, she died overnight of sudden liver failure on the foot of my bed while I slept. Waking up to that was traumatizing but this is so much worse. This is the first time I've ever cared for an animal all the way to life's finish line, and KC wasn't just any animal, he was my best friend, the friend who was there for me during the previous worst experiences of my adult life. Now I have to deal with this without him here and it's so hard. KC was my companion for the past eight years. He had belonged to my mother and stepfather and they mostly neglected him, keeping him outside and rarely spending time just with him. He spent those younger adult years as an overweight 30-pound cat who wandered their neighborhood for attention because he wasn't getting much of it at home, so I brought him to live with me when I was in college. He traveled with me wherever I relocated and most of the time he was totally fine with car rides as long as he got to be on my lap. He was my four-legged Road Warrior companion, my Abu, my Pikachu. We stuck together. 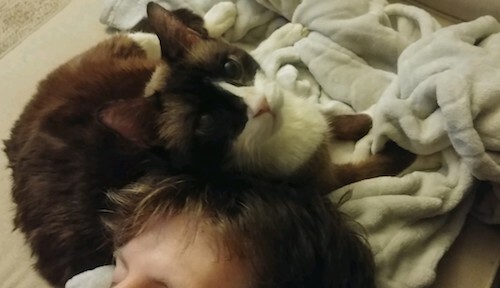 He was such a mellow and cheerful cat who showed me love and devotion every day, lying on or against me in just about any situation and purring so readily when I approached him. He was my cat and he absolutely claimed me as his human. KC just had bad luck with his pancreas. If I hadn't adopted him to live with me, he would have died in 2013 at age 9 when he became diabetic, probably alone under my stepfather's shed, but instead he got to manage his diabetes and lose a lot of weight and live for six more years as a happier, more active, 17-pound cat. It was ultimately pancreatic cancer that proved to be insurmountable. He was diagnosed with small-cell lymphoma last February, and at the very least, the steroid/chemotherapy oral tablet regimen we gave him prevented that from turning into large-cell lymphoma. The oncologist told me this week that KC's pancreatic cancer probably didn't develop from the lymphoma but was something that was always bound to happen. He said the only possible treatment for pancreatic cancer would have been hospitalization with IV-injected chemotherapy, that it doesn't work on most cats, that the ones it works on are the ones who are already handling the disease rather well, and that it always makes them worse before it has a chance to make them better. KC was already 15, he'd already had diabetes due to his pancreas, and I know that IV chemo wouldn't have worked on his pancreatic cancer. It would have only ended with him dying in a hospital, far from home, feeling terrible and wondering where Tab and I were. I miss KC so much but I am so, SO glad that we were able to spare him from the wrong kind of departure. KC kept fighting right up to the end and we were right there with him the whole way. He had his first and only-ever seizure due to hypoglycemia on Friday, March 29, which drove me to set up the GoFundMe campaign. The vets were able to save KC from that and although he spent that night in the hospital, he got four more nights at home with Tab and I after that. His strength seemed to be slowly recovering each day, as he gradually ate more and seemed better able to walk around, and he still demonstrated his resilient autonomous nature. Most importantly, he was happy on his final days. He was home. He was with his family. Tab and I monitored him around the clock. 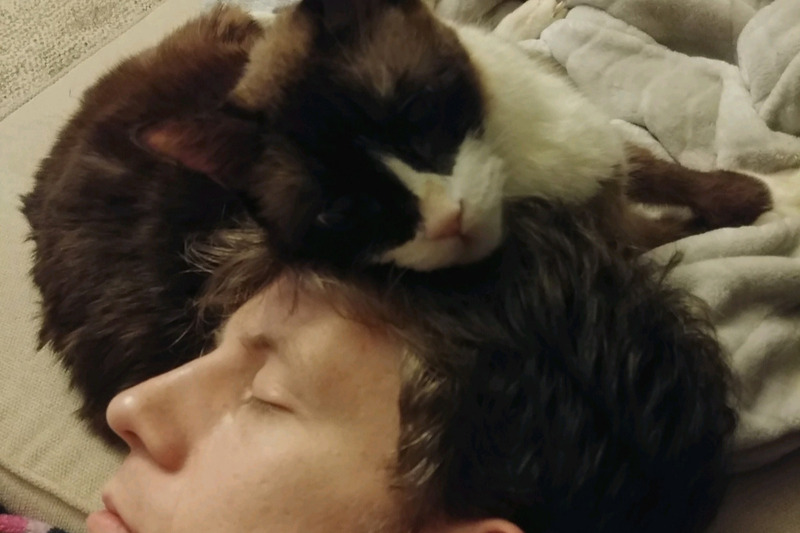 He spent most of his last days resting but that meant lying on our laps the way he always did, curling his head and purring like a motor as we scratched behind his ears. Even on his final day, just hours before his energy started diminishing fast, he was lying in the closet right next to Hershey and they purred loudly together as I petted them for 12 minutes straight. KC loved his life and his final morning was one that he was as happy to wake up to as he ever was. I think that his pancreas just finally gave out in the later afternoon and that's why he suddenly got weaker. It was just KC's time. Wednesday, April 3, 2019 was as far as the hardest-working pancreas in the world could go. I was so afraid that KC would die painfully during the night but the vet who made the evening house call was exactly the angel that he needed to visit. KC knew that Tab and I were right there for him. His claws clutched my fingers when I touched his paw and I looked into his eyes and repeated his name soothingly. KC always loved hearing me call him by his name and I made sure that he got to hear that as he slowly fell asleep. He knew and understood that we were with him all the way and we gave him the peace that he deserved in the end. I know I'm going to get by. Tab loves and misses KC every bit as much as I do and we're here for each other. We formed a family with KC, Hershey, and Mercury and we got to share our home together for the past five years. We all love each other and we're helping each other get through this. The other two cats were present when KC passed and they were clearly distraught. Tab and I kept his body lying on that same quilt on the living room floor overnight with his head uncovered so they could comprehend what happened on their own time. We're all in mourning. Hershey has been spending a lot of time sleeping in the closet where he last lied next to KC. Mercury was calling out for KC in the middle of the night. Tab and I are making sure to give them extra reassurance and they are doing the same for us when they can tell we need it. Talking about this is really therapeutic for me too. I've been having anxiety attacks, which I've never had before in my life, but I was able to type all of this without feeling any coming on so I think that's a good sign. I will definitely be utilizing my job's grief counseling program. This all just happened so fast and I know I should have been prepared but I wasn't. I love my best friend and now my best friend is dead. I'm just glad that we were able to give KC a long and happy life which he absolutely loved, and the peaceful, loving exit to eternity that he deserved. It was heartbreaking to read your posts, but so enriching at the same time. It's so awesome & wonderful that you rescued KC from the hollow life he had been leading before you came along. Rescue animals know inside that they were saved and they never forget that - nor the one who saved them. Zeus was a sort of rescue in that he was this huge 110lb Dobie/hound mix that had been cooped up in an tinyass apartment with two other, bigger(!) dogs who did not appreciate his presence. The "owners" just wanted basically to be rid of him and yet when they brought him out to me they were concerned that he would be scared and not like it at my place. I have 10 acres in the country and I can tell you that is EXACTLY where he belonged. We had an uneasy first few days, feeling each other out, so to speak. Soon though he was loving all this space to just run and run (and play!!!) and he stuck to me like glue afterwards. I had a rescue cat (Harley) at the time and despite my initial concerns, the two of them got along just fine. Miss Priss (my old lady kitty) was found abandoned near my house mere weeks after Zeus came into my life. She brought out the kitten in old Harley - in spite of himself - and enriched his last few years, I know. When my wife moved in a short time before we married she brought along her two dogs, cat and three ferrets! It has been a regular Noah's Ark here every since and while it can be overwhelming and chaotic at times, I wouldn't trade any of it. This house would be one sorry hollow shell without all of our critters racing, playing and snoozing together in one cohesive mixed 'foster' pack. They come in and add immeasurably to our lives and unfortunately leave much too soon, but the rewards have outweighed the downsides beyond measure. I truly pity those who don't know (or want) the amazing, unconditional love of a dog(s) or cat(s). Speaking of... keep an eye on your other two cats. They are undoubtedly dealing with the sudden absence and loss, in their own way. Animals do grieve but are also more 'accepting' of death; it's just nature to them and they soldier through. They'll likely be fine. Just be sure to give them attention (and space, too) and you'll all sail through this rough weather in due time. Remember the good times when you feel down, and cling to each other through it all. ^ Yeah, Zeus was most definitely better off living with you than being confined to an apartment with people who didn't even want him. Look at how happy he is in that photo! The animals we care for have such a limited number of days compared to us and all we can do is try to make it a time worth living. It's always great when dogs and cats grow to love each other. KC grew up around dogs for the first half of his life so he was always very calm whenever he met new dogs. I am glad that Tab and I were able to give him a family with two other cats for the entire last third of his life. Hershey had previously belonged to one of my roommates when I was in college so he and KC had already lived together before. Mercury was just a kitten when Tab rescued her so we had three cats of vastly different ages under one roof for five years. KC was the senior, Hershey the middle-aged and Mercury the youngster. They really brought out the best in each other. Before we all moved in together, KC had spent the previous year losing a lot of weight, so the other two cats encouraged him to run around and play in ways he hadn't since he was very young. He tended to run by either trotting quickly or bounding like a bear. I didn't want to perceive just how old KC was while he was alive and part of what made that easy was that he still showed so much vitality and enthusiasm to play with us and the other cats between all of his regular sleep sessions, medicines and meals, even during what ended up being his final year. Even after his lymphoma diagnosis, he was handling the chemo/steroid treatment so well and he was still acting so much like himself that I really thought he had several more years ahead of him, and maybe he would have if he hadn't also developed pancreatic cancer. I know I should have seen this coming given his history of diabetes. 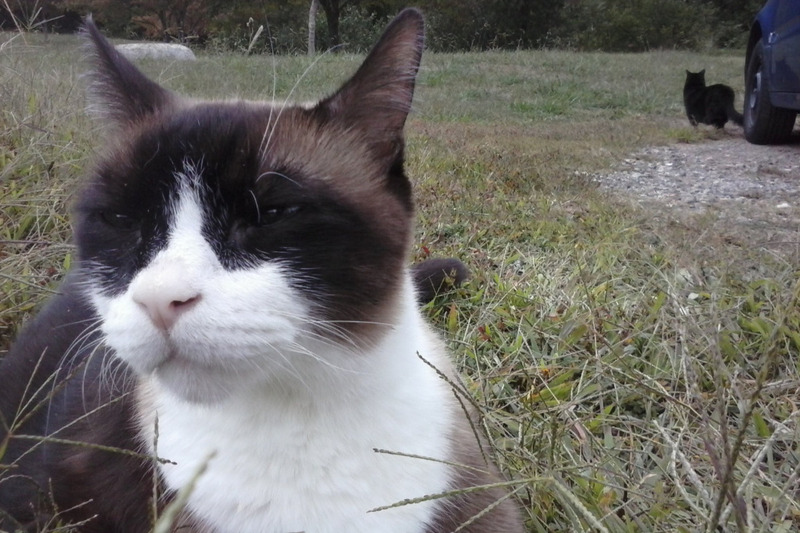 I just really wanted to believe that his history of resilience pointed toward longevity, but again, 15 years and 4 months was already so long of a life for a cat that got dealt so many bad cards health-wise that I really should have anticipated this happening around this time.